My mom would give me $2 a day to buy a hot lunch in high school. This was in the early nineties in suburban Cleveland to give you some context. She wasn’t being stingy – it was just how much (or how little) a full hot lunch cost back then and there. But instead of buying a full lunch, I’d only spend $1 and pocket the rest so I could buy cassettes. My $1 a day, Monday to Friday, savings plan would yield a cassette every two weeks. For my lunch, I subsisted on a slice of pizza or a bowl of fake mashed potatoes with fake gravy (better than it sounds). At this rate, it would take me so long (too long!) to buy the whole Replacements back catalog let alone all the bands I read about in Sassy Magazine. I needed a job. My best friend Natalie got me a job working with her as a waitress at a Ukrainian church hall on Saturdays doing weddings and other big dos. Every Saturday after Ukrainian school, we’d show up to the hall to begin the set up. Natalie and I were just two of the crew of teenage Ukrainian-American girls that worked these events. We draped the tables in coloured tablecloths, fold the colour coordinated napkins, and set the tables with plates, silverware and glassware. We’d then change into our sensible black skirts (to the knee!) and white blouses (blousey blouses!) and tie on our white dainty aprons (random ones from the kitchen). With no intention of looking good (or cool which is better than looking good), I just cobbled together a uniform, primarily made out of polyester, that was machine washable and didn’t rely on me actually spending money on it. Ukrainian lady cooks ran the kitchen; they’ve been running things every Saturday since I think people first started having weddings. After suiting up for service, we headed into the kitchens to load up our carts with large platters and bowls of family style food to serve the guests. We’d roll out the carts into the big hall, a parade of sensibly dressed teenage waitresses pushing heavy carts, moving as fast as possible so that the food was hot, hot, hot when it hit the table. As soon as the food was served, all the waitresses and cooks sat down to a long table in the kitchen to eat the same big meal as the guests. It was pretty much the same menu every wedding – roast beef and gravy, boiled potatoes tossed with butter and dill, cabbage rolls, salad, vegetables ‘California-style’ (broccoli, cauliflower and carrots), rigatoni with meat sauce. Something Ukrainian, mid-western meat and potatoes, something Italian and of course something Californian. And then the fancy bit – there was either Chicken Cordon Bleu or Chicken Kiev. Mind you, neither of the fancy chickens were homemade; they came frozen out of box and were reheated in the oven. But it didn’t matter to me; fancy chicken (even out of a box) was something extra-ordinary. My mom didn’t make anything like this at home. I preferred the Chicken Kiev, just because of the name. Capital of Ukraine! Even though it’s the Russian spelling! Especially compared to that French imposter Chicken Cordon Bleu. After our staff meal, we’d head back out into the hall to see if anyone wanted seconds. We hoped that they didn’t since the sooner everyone was done eating the faster we could clear the tables and get out of there. We’d do a first blitz around the dining room grabbing anything that we could clear off the table. Then we waited for the rest of it all. Leaning up against the wall in the back, watching like hawks for any piece of cutlery or glassware that was left unattended, we’d swoop in and clear. Sometimes this took a while. We watched the crowd, chatted amongst ourselves, judged people on how they danced, and wished to be home already. Occasionally, a drunk guy, around the same age of a granddad, would come out of the bar and ask us to polka. The answer was always no, no matter how much we wanted to. We were professionals. Once everything was off the tables, aside from the tablecloth and decorations, we’d head back into the kitchen to polish and put everything away for the next Saturday. Oh and what about the cassettes? Each Saturday I earned about $30 cash – under the table, no tax, and all mine. I can’t believe how much money that seemed to me when I was handed that envelope. That money, from just one shift, was enough for three tapes and I didn’t have to endure 6 weeks worth of weekday school lunch malnourishment to get them. And I got to have fancy chicken every Saturday night. My mom never made Chicken Kiev and for all the Ukrainian women cooking and the Ukrainian girls serving, I don’t think any of them ever had this dish made at home, either. It didn’t really seem Ukrainian. And I found out that it’s not; not organically Ukrainian, a dish made in the family home generation after generation that becomes part of a people’s collective food history. Its history is unconfirmed – either it was created by a chef in the 1960’s for the grand opening of a four star hotel in Kiev named the Hotel Moscow or it was created by a French chef and served at the Russian imperial court when Tsars were still around. Either way, this is not a dish something families (like mine) would be making back on the farm in rural western Ukraine. I attempted two recipes to see which worked best. 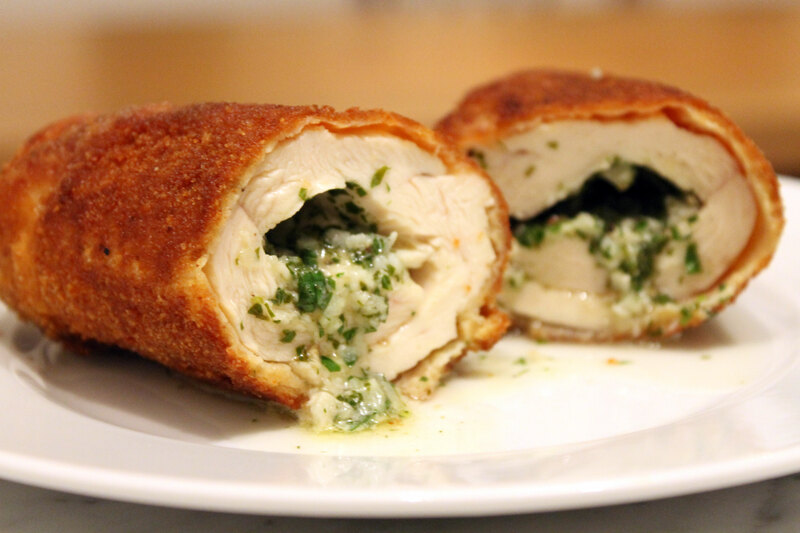 The Chicken Kiev recipe from Hugh Fearnley-Whittingstall’s The River Cottage Meat Book (Ten Speed Press, 2004) was anxiety inducing, unnecessarily difficult and failed. Hugh actually wants you to buy a whole chicken, break it down, and then debone and skin the breasts. Which is fine, I guess. I know how to breakdown the chicken but then wasn’t sure how to debone and skin the breasts with the first joint of the wing still attached (that wing detail he says “makes it ‘authentic’). I flip to the page in Hugh’s book where he is supposed to detail how to do all of that. His instructions on how to debone and skin the breasts with that little f*@#ing wing joint attached are: “trim out the lean meat.” That’s not exactly helpful, Hugh. Felicity Cloake’s recipe in the Guardian was the exact opposite of Hugh’s. She actually calls him out on his version. She’s done a bit of research on the dish and offers up a lot of helpful hints. The link is below. I don’t usually mention kitchen tools and supplies with recipes, but please make sure you have enough cling film on hand. You’ll need it for three different steps. 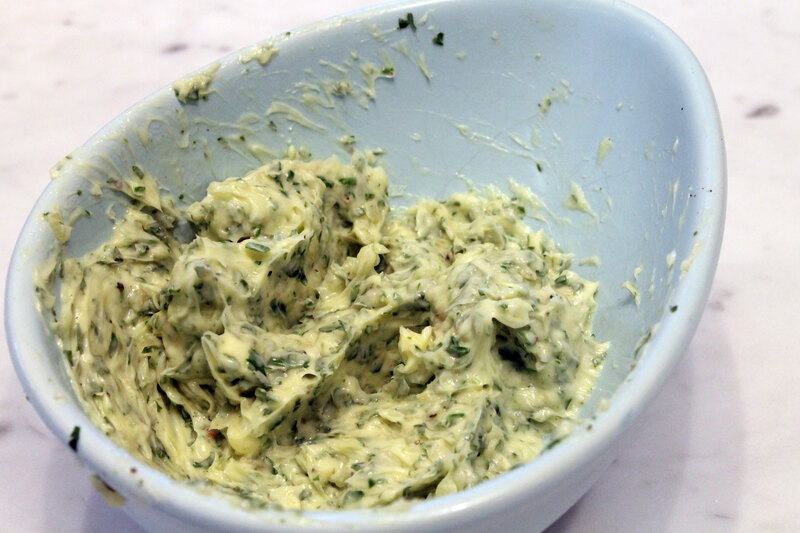 Beat together the butter, garlic, parsley and lemon juice with a pinch of salt and plenty of pepper. Divide into two blobs, place each in the middle of a piece of cling film, fold one half of the cling film over the butter blob, shape the butter into a sausage, then roll it up. Twist the ends of the cling film to secure the butter and place the little packages in the fridge to chill. I did lick some of the garlic butter off the spoon. And then off my fingers. It’s delicious. If you can’t find butterflied breasts, here’s how you do it. Place each butterflied breast of chicken between two pieces of cling film. Using a meat mallet, pound the breasts until they thin out to about 1/4 of an inch. Be really careful that you don’t create any holes in the breast meat or the dish is ruined. If there are any holes, then when the butter melts it will leak out. That butter staying inside is the whole point of the dish. No pressure! Season both sides of the chicken with salt and pepper. 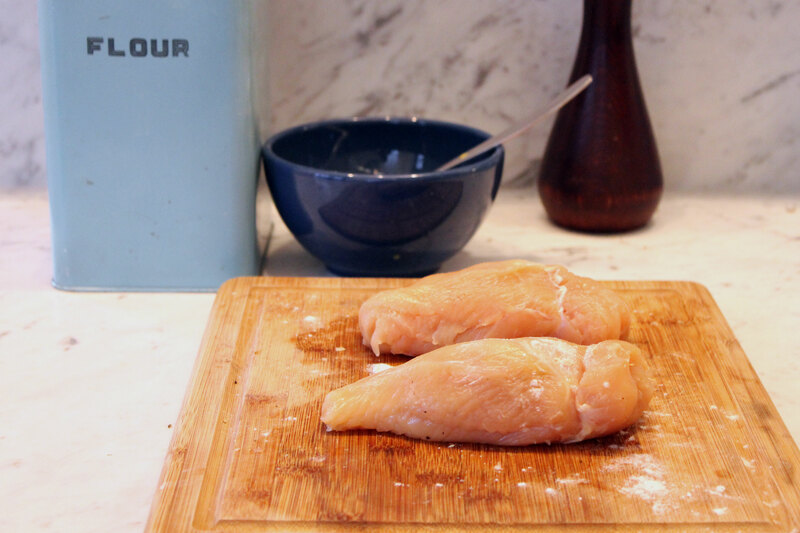 Place the chicken breasts horizontally in front of you. Place a piece of butter close to the edge of the breast (breast and butter both placed the long way), fold the bottom flap of chicken over the butter, fold in the sides, and roll up. Same method as if you’re rolling up a burrito. If the edges aren’t staying put or the end flap won’t stick, then use a little bit of beaten egg and flour like glue to seal the deal. When I rolled up one of the breasts, the sides wouldn’t stay put even with the flour and egg so I used toothpicks to seal the seam. There is no shame in this. Place the rolled up chicken breasts on a piece of cling film, and wrap them tightly, rolling them up (again) like a burrito. Place in the freezer for about 1 1/2 to 2 hours. 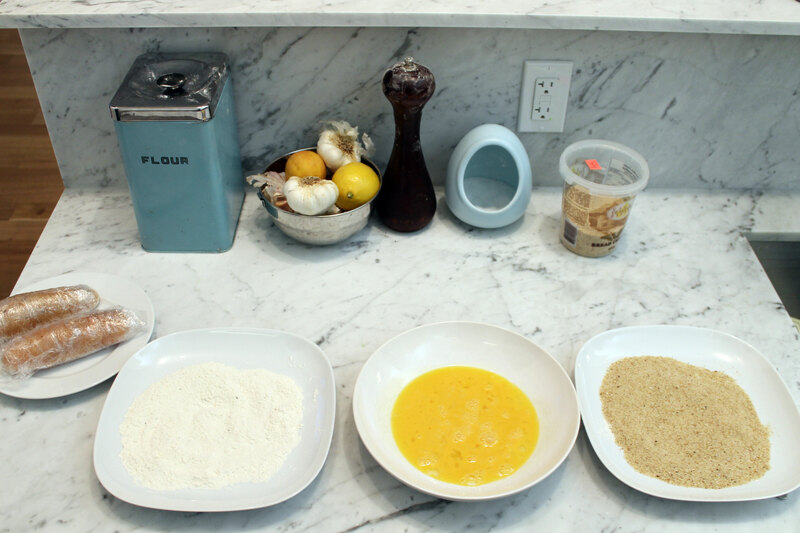 Lay out your flour, beaten eggs and breadcrumbs in shallow dishes. 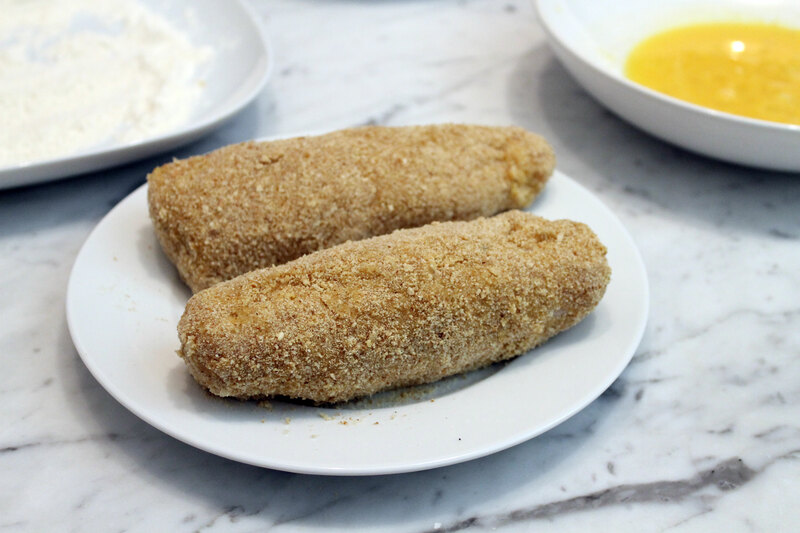 Take the Chicken Kievs out of the freezer and dredge them: flour first, then eggs, and then breadcrumbs. Repeat the eggs and breadcrumbs. Set them on a plate in the fridge and let them thaw out for an hour. Your Chicken Kievs should have a nice oblong shape and they should be sealed like Fort Knox. When ready to fry, heat the oil in a large frying pan (or even better – a dutch oven) to 325 F. The oil should come up and cover or almost cover the entire chicken bundle. Fry the chicken in the oil for about 10 minutes. Turn them periodically so they colour evenly on all sides. They should be golden brown. If you’re making multiple batches, you can keep the fried Chicken Kievs warm in the oven while you wait for all of them to fry up. I also like to have a preheated oven on the ready if my chicken starts to brown to quickly and I feel I have to pull them out before I think they’re cooked all the way through. I can then finish off the little Kievs in the oven. This ended up happening to me on the latest attempt. I pulled them out when I didn’t want them to get any more ‘golden brown.’ They then went into the oven for five additional minutes to make sure they were cooked all the way through. 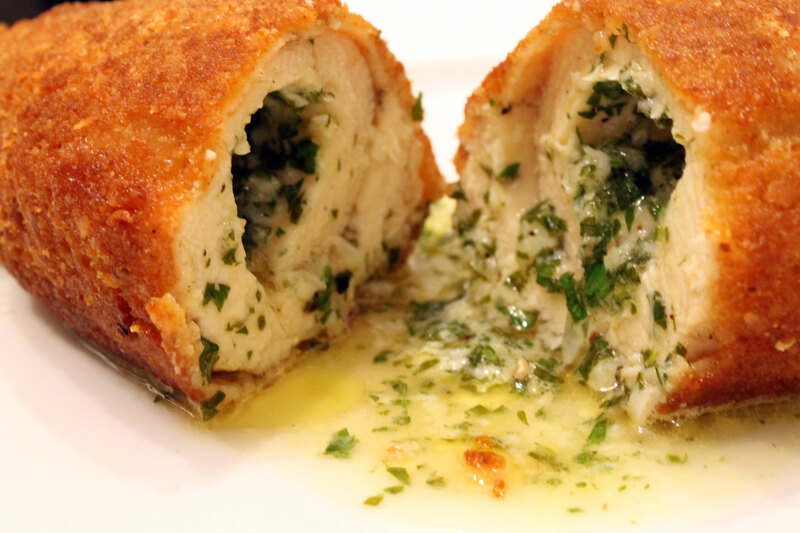 When you cut open the Chicken Kiev, the herb and garlic butter should ooze out onto the plate. When I was making these, I thought this dish was way too fussy and troublesome. I knew why those Ukrainian church hall ladies bought these premade. But when I cut the Chicken Kiev open and that herby, garlicky butter oozed out, all that trouble was worth it.